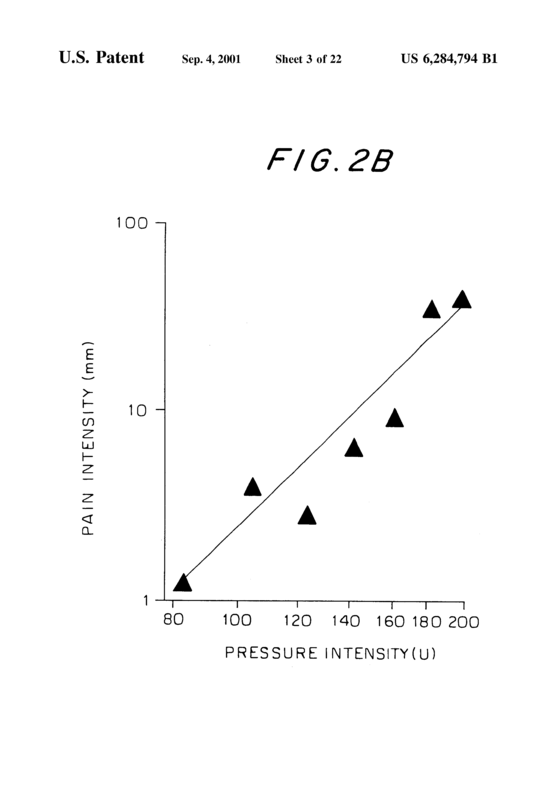 Tension-type headache is treated by interacting with neuronal transmission in relation to pain in connection with headache in a way which prevents or decreases sensitization of second order nociceptive neurons. 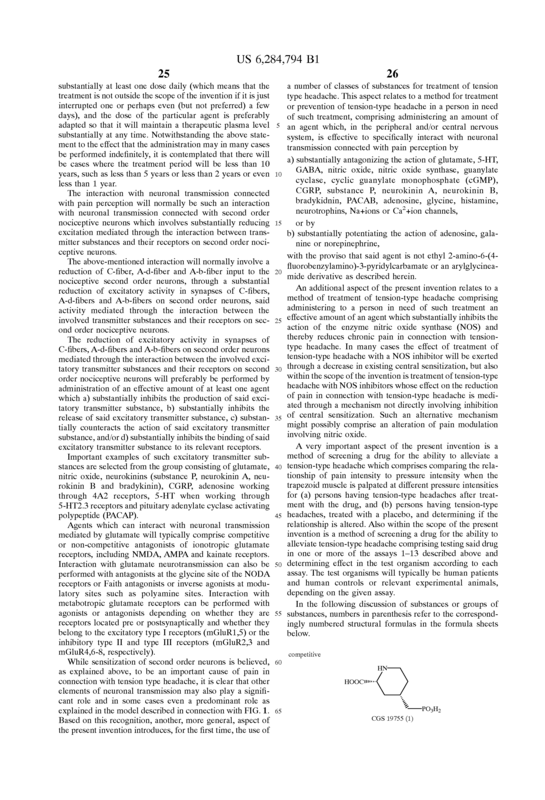 In particular, treatment is performed by administration of an effective amount of a substance which prevents or decreases central sensitization. 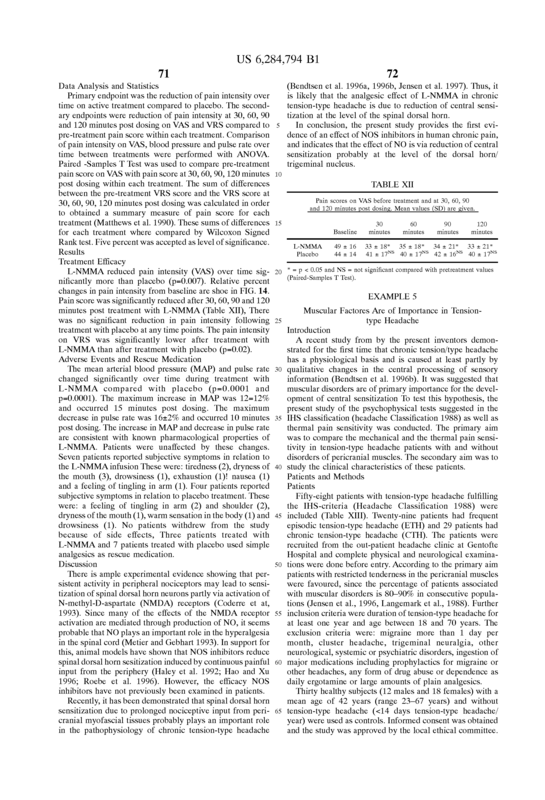 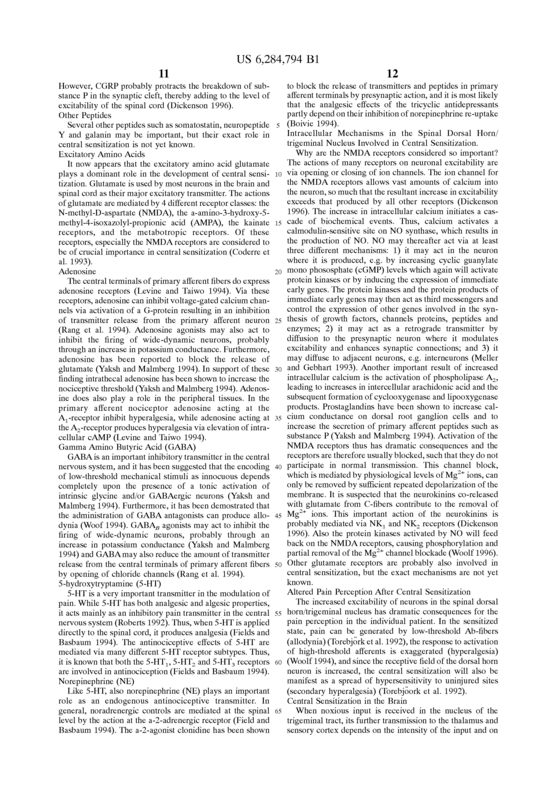 Important examples of such substances are substances which interact with nitric oxide, such as nitric oxide synthase (NOS) inhibitors, such as L-NMMA or L-NAME or L-NIO or L-NNA. 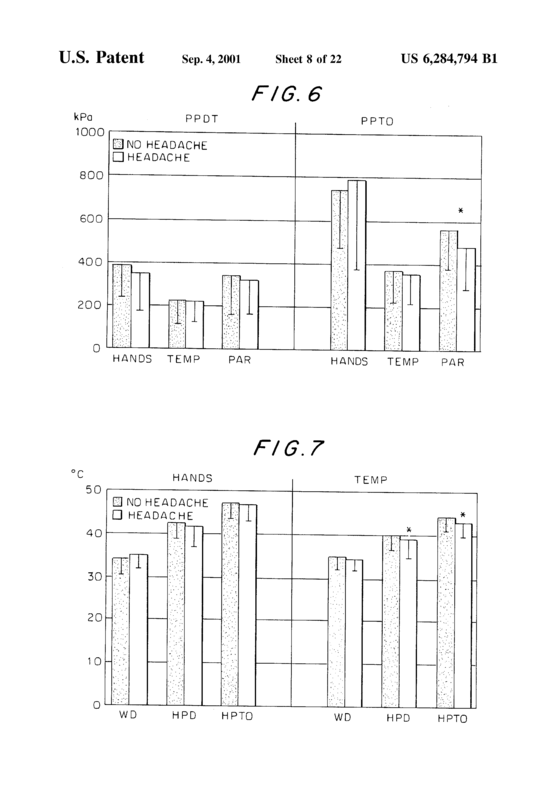 According to a broader aspect of the invention tension-type headache is treated by administration of substances which are effective in preventing or decreasing pain in connection with tension-type headache, such as the substances mentioned above. 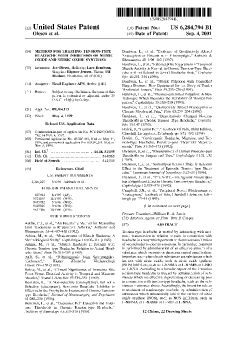 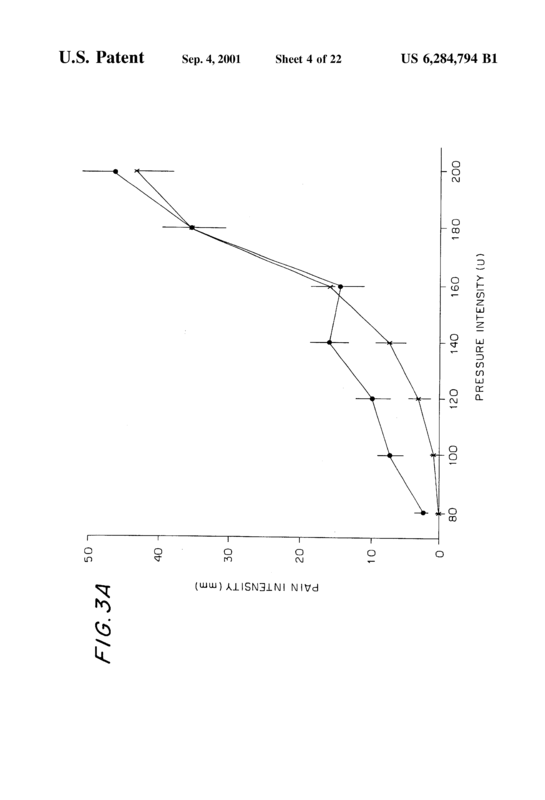 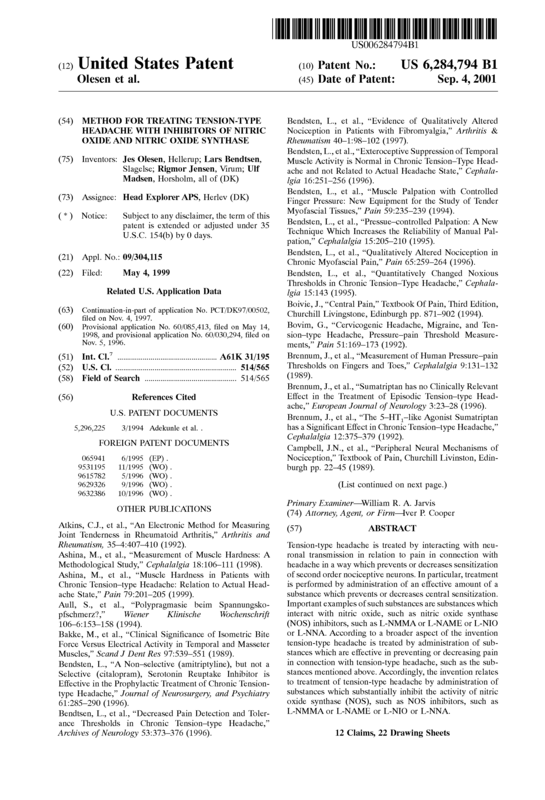 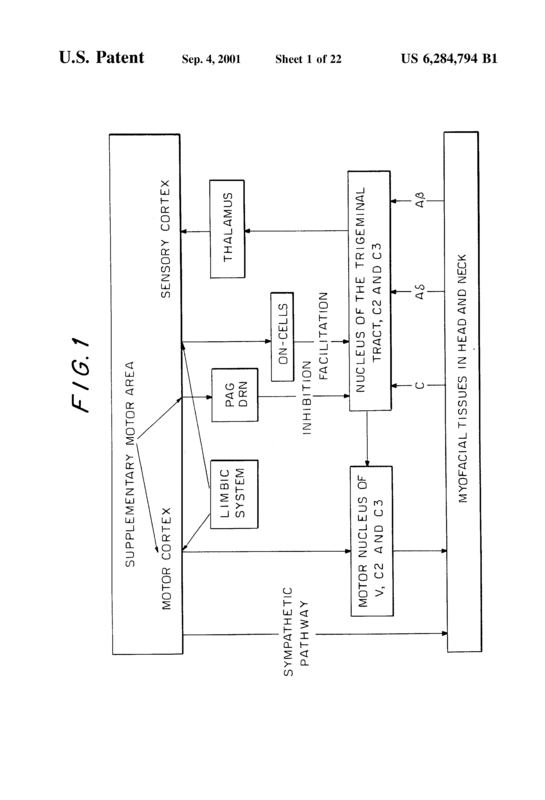 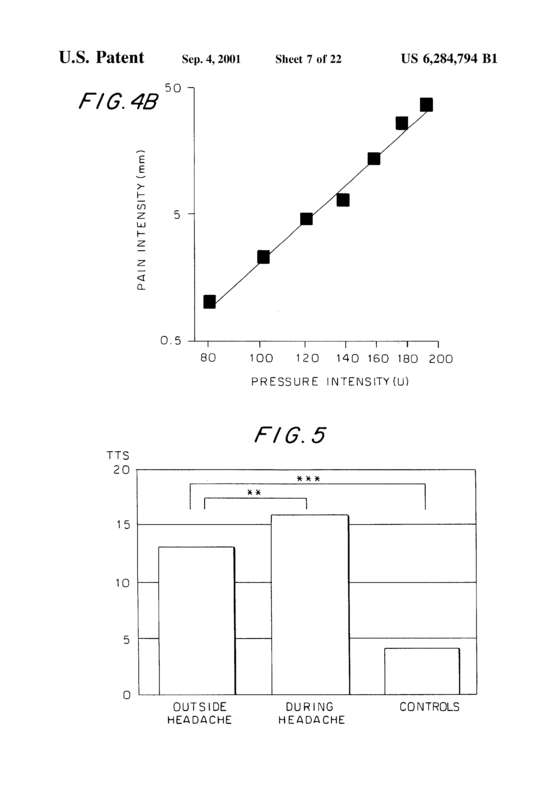 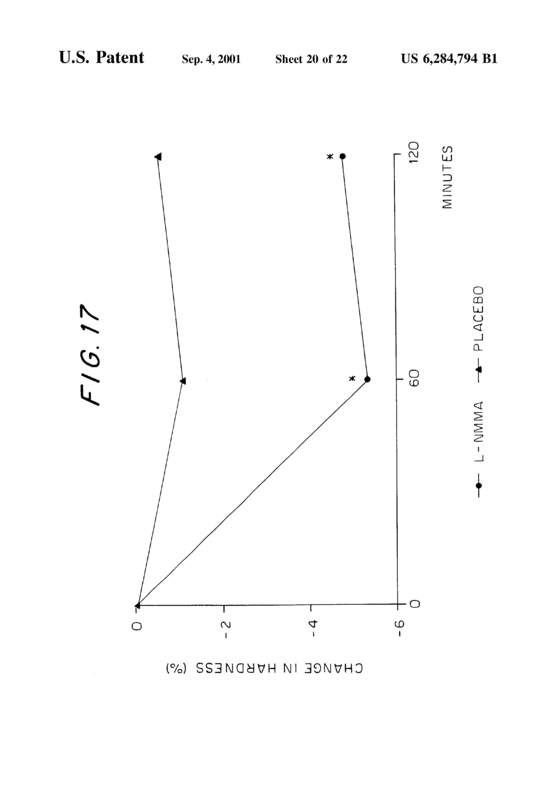 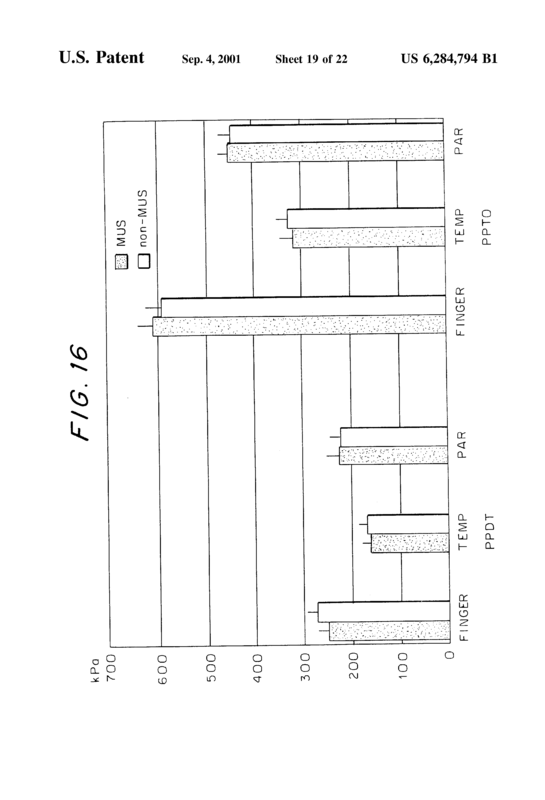 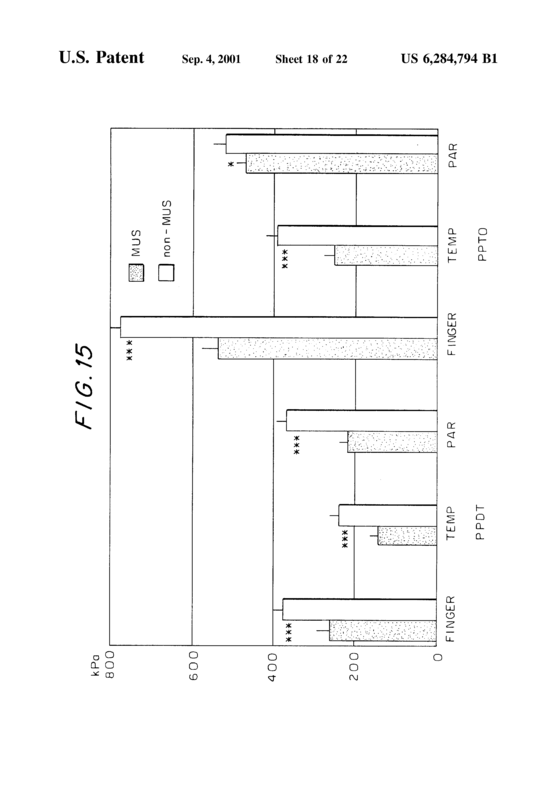 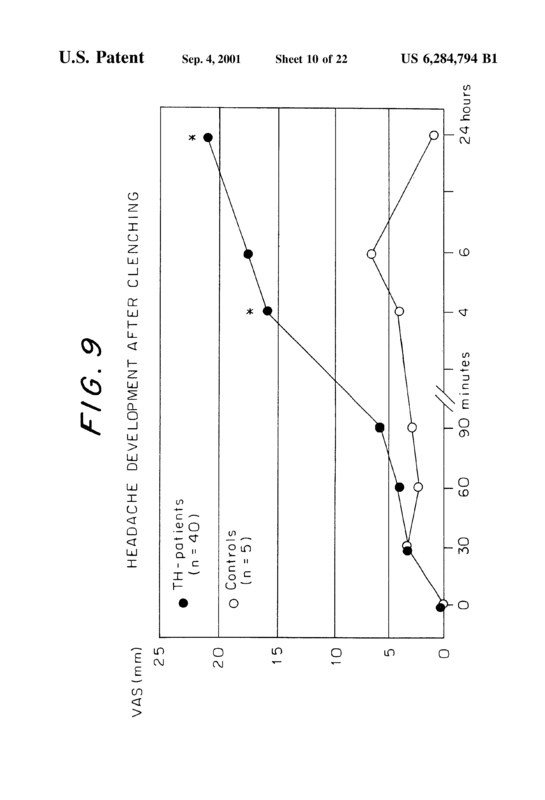 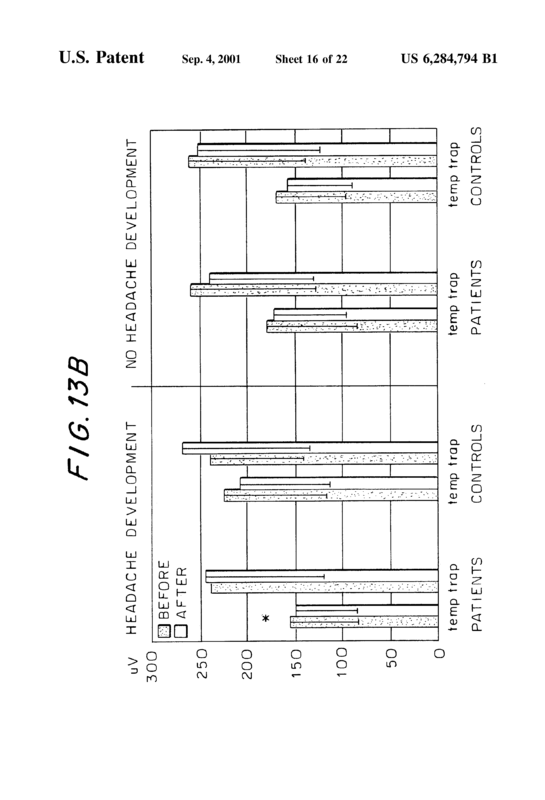 Accordingly, the invention relates to treatment of tension-type headache by administration of substances which substantially inhibit the activity of nitric oxide synthase (NOS), such as NOS inhibitors, such as L-NMMA or L-NAME or L-NIO or L-NNA. 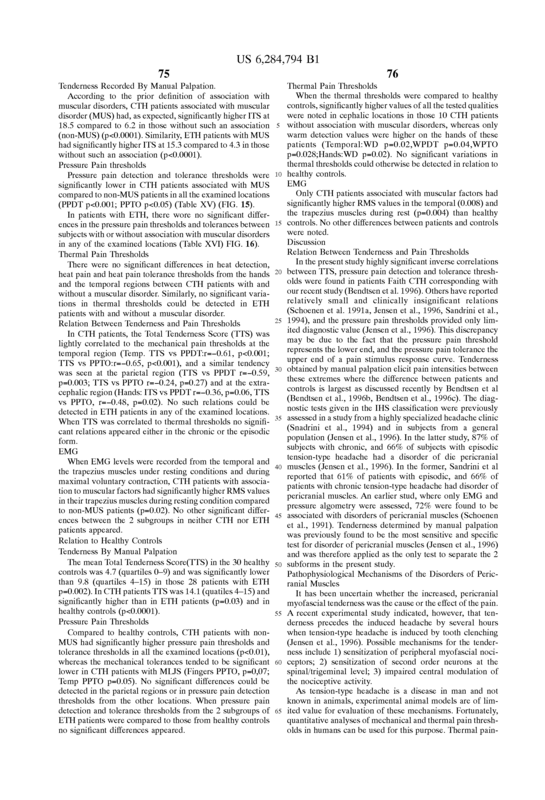 A method for treatment or prevention of tension-type headache in a person in need of such treatment, comprising administering to said person an amount of an agent effective to interact with neuronal transmission connected with pain perception, so as to prevent or reduce central sensitization, wherein said agent is an agent which, in the peripheral and/or central nervous system, is capable of substantially inhibiting the production of nitric oxide or substantially counteracting the action of nitric oxide or substantially inhibiting the production of nitric oxide synthase (NOS) or substantially counteracting the action of nitric oxide synthase (NOS), with the proviso that said interaction is not performed by administering ethyl 2-amino-6-(4-fluorobeznylamino)-3-pyridylcarbamate or an arylglycinamide derivative as defined herein. 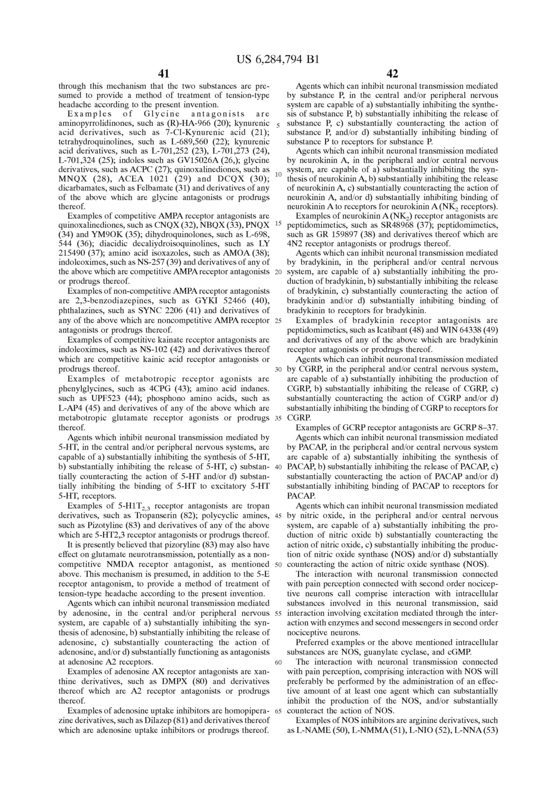 A method according to claim 1 , wherein the agent comprises a nitric oxide inhibitor. 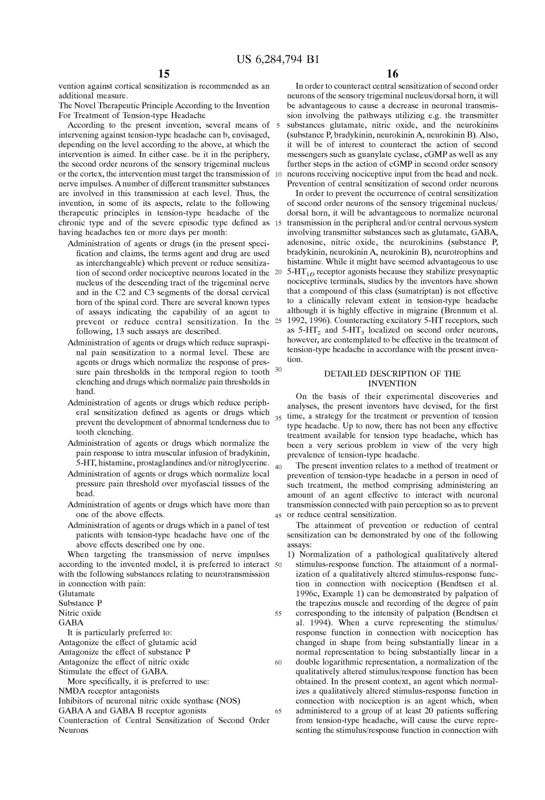 A method according to claim 2 , wherein the agent comprises an NOS inhibitor. 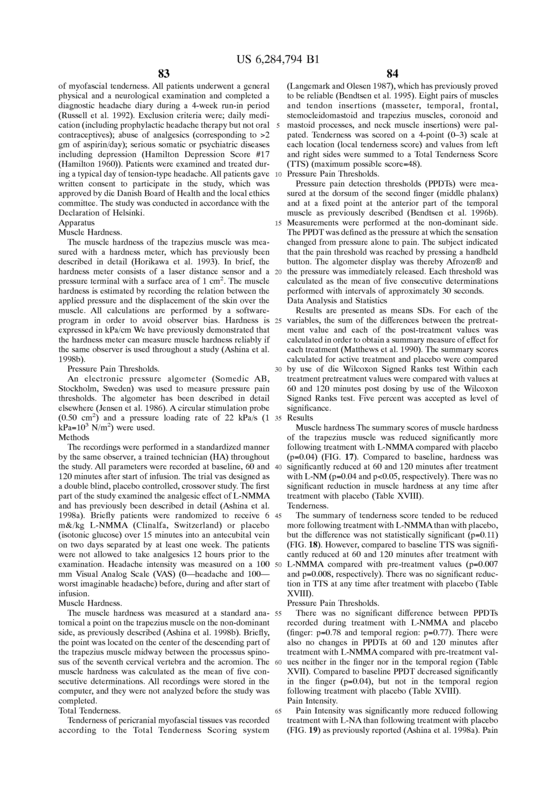 A method according to claim 3 , wherein the agent is selected from the group consisting of arginine derivatives, citrulline derivatives, indazoles, imidazolin-N-oxides, phenylimidazoles, 21-aminosteroids, biphenyls, piperidine derivatives or derivatives of any of the above which are NOS inhibitors or prodrugs thereof. 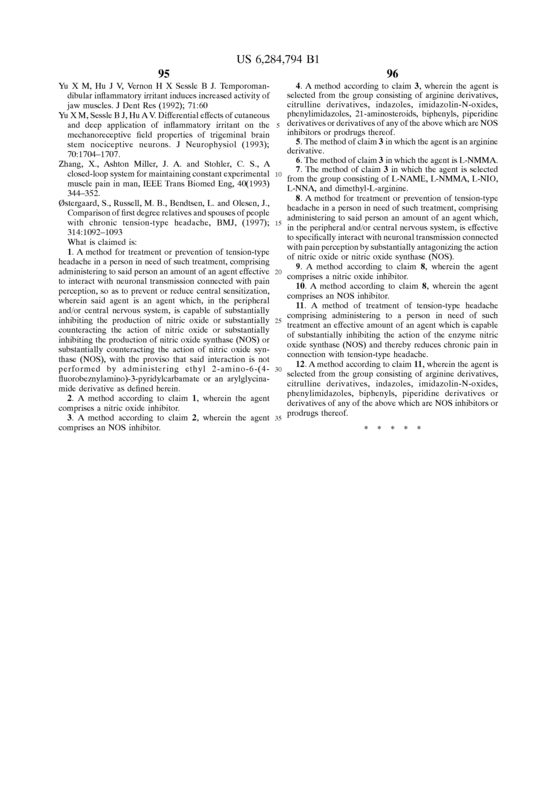 The method of claim 3 in which the agent is an arginine derivative. 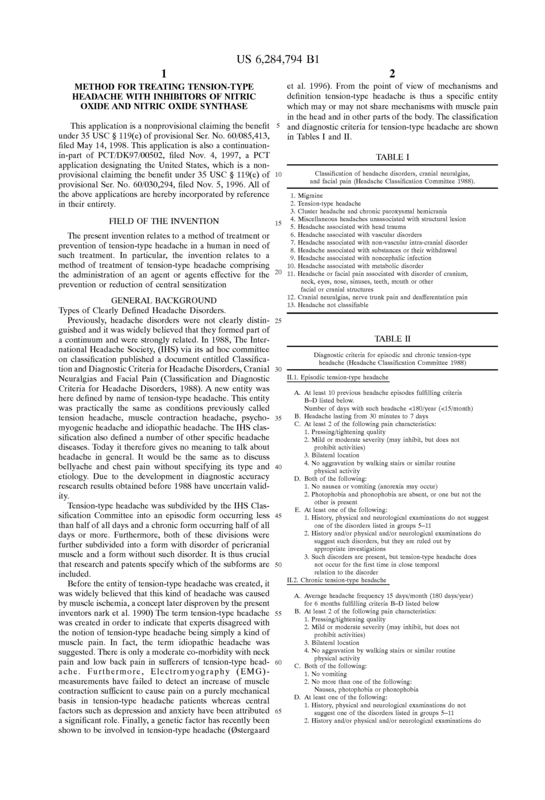 The method of claim 3 in which the agent is L-NMMA. 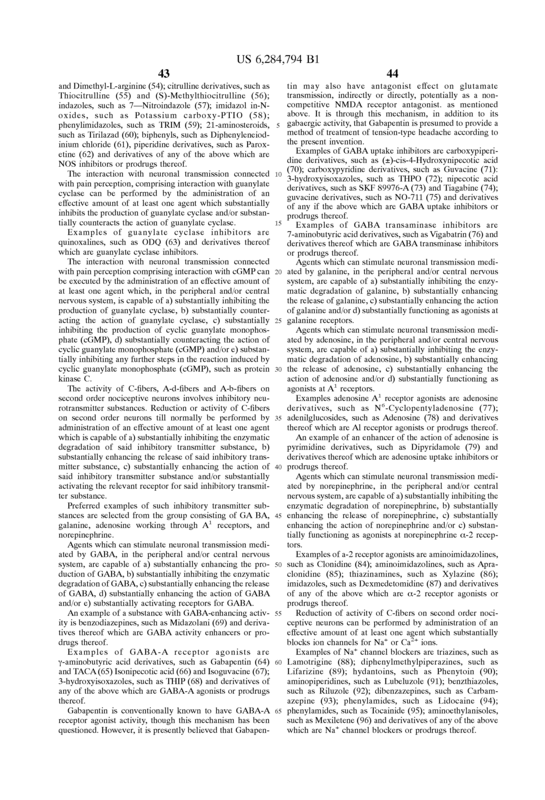 The method of claim 3 in which the agent is selected from the group consisting of L-NAME, L-NMMA, L-NIO, L-NNA, and dimethyl-L-arginine. 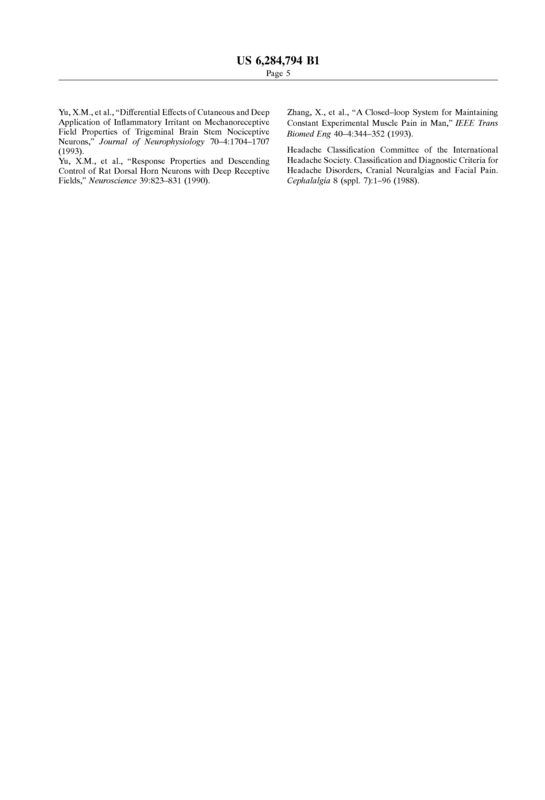 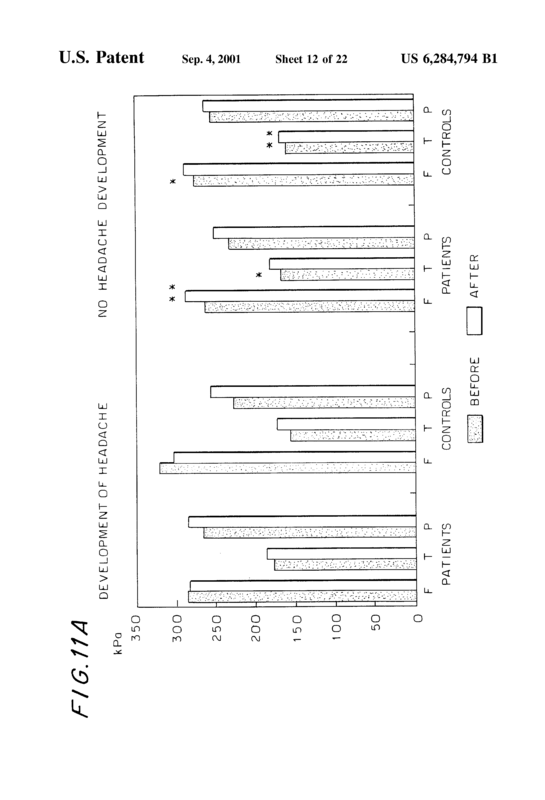 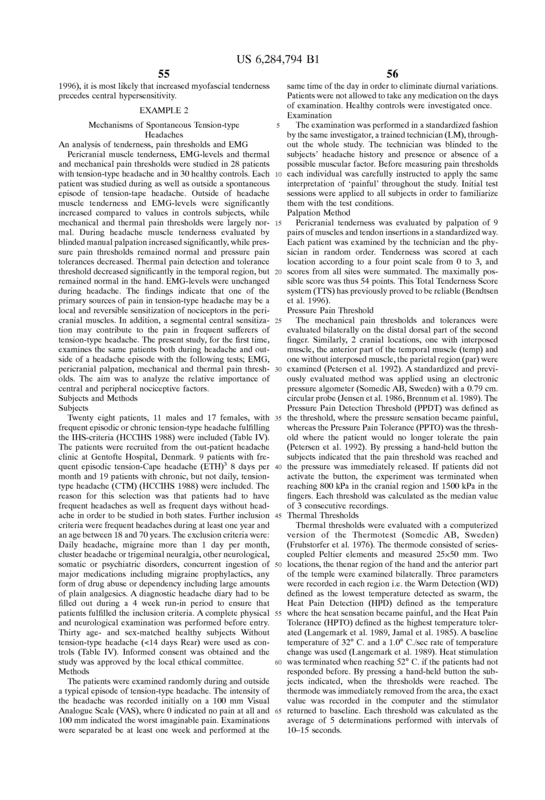 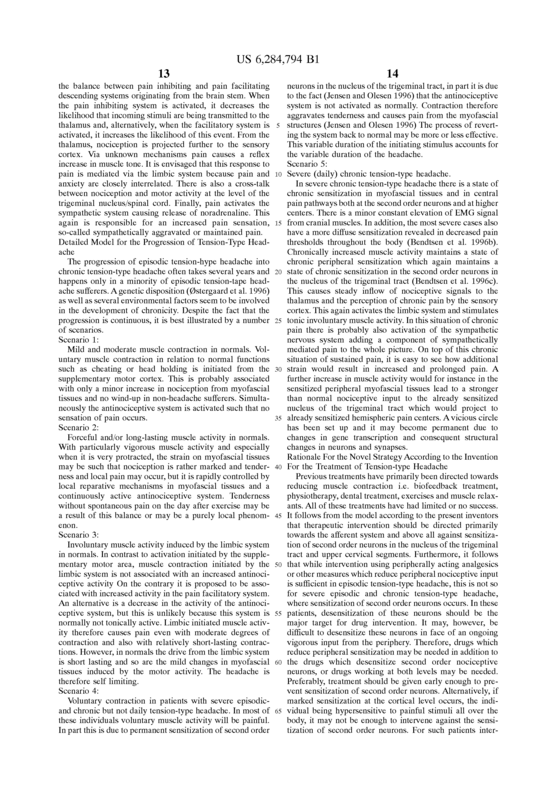 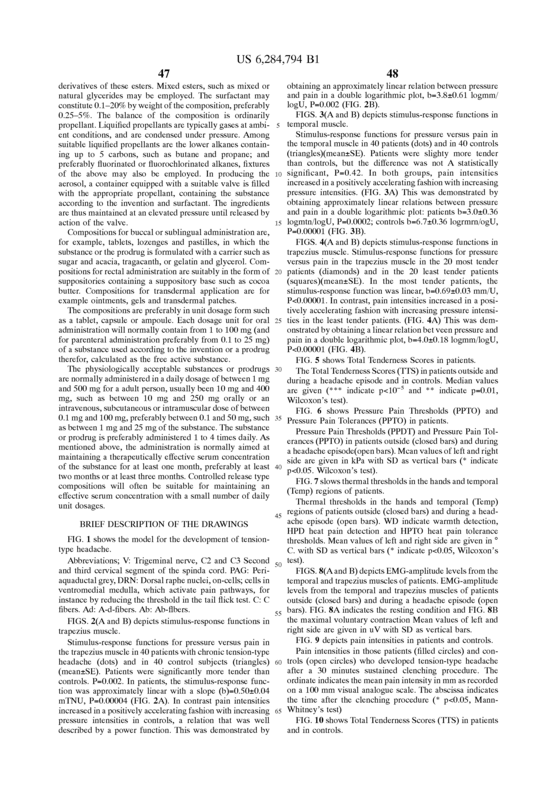 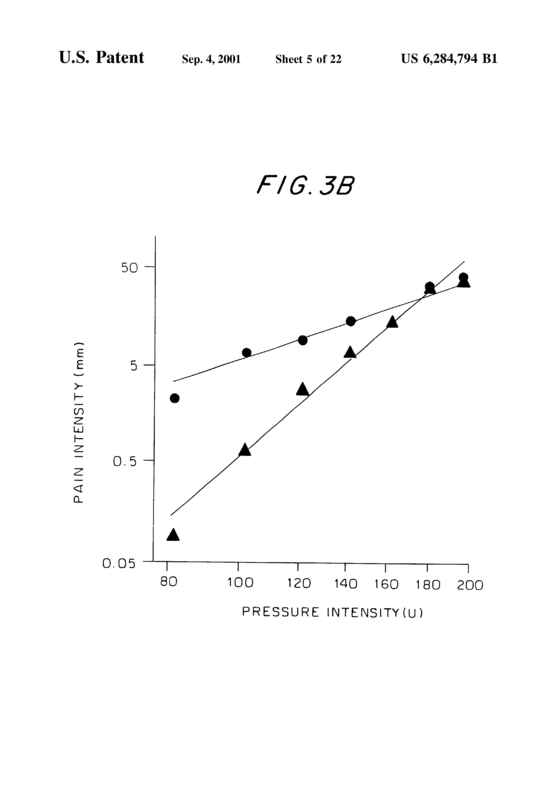 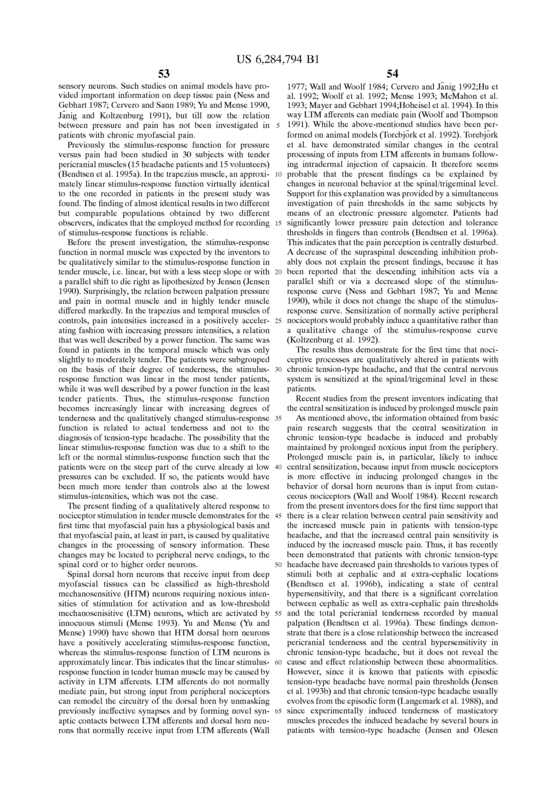 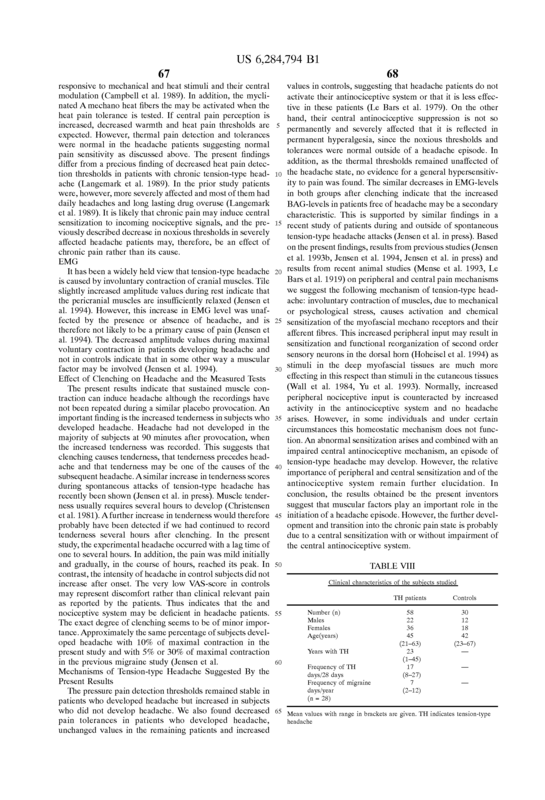 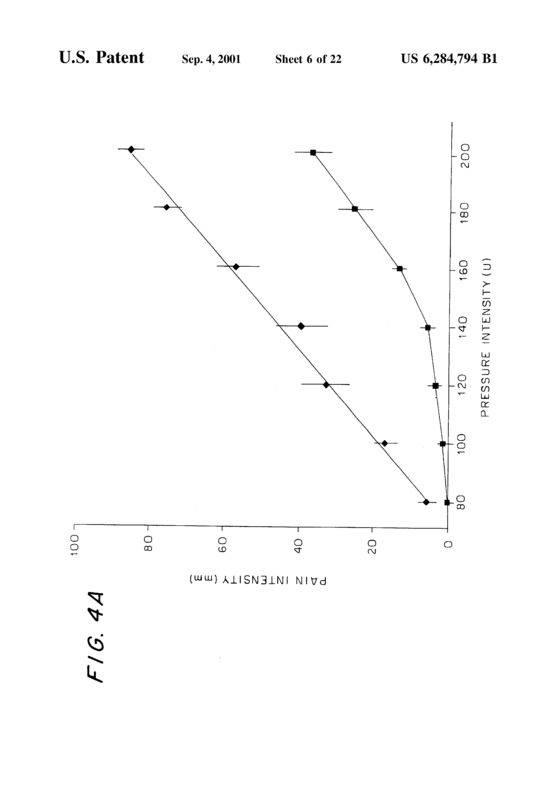 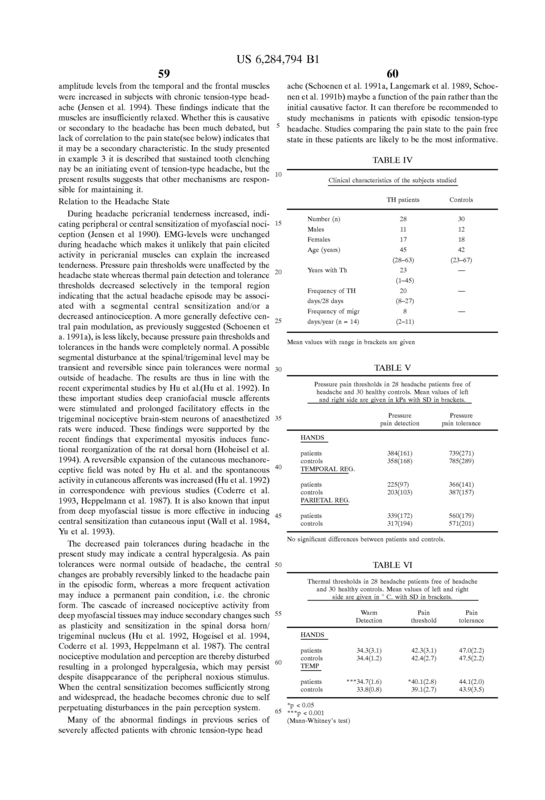 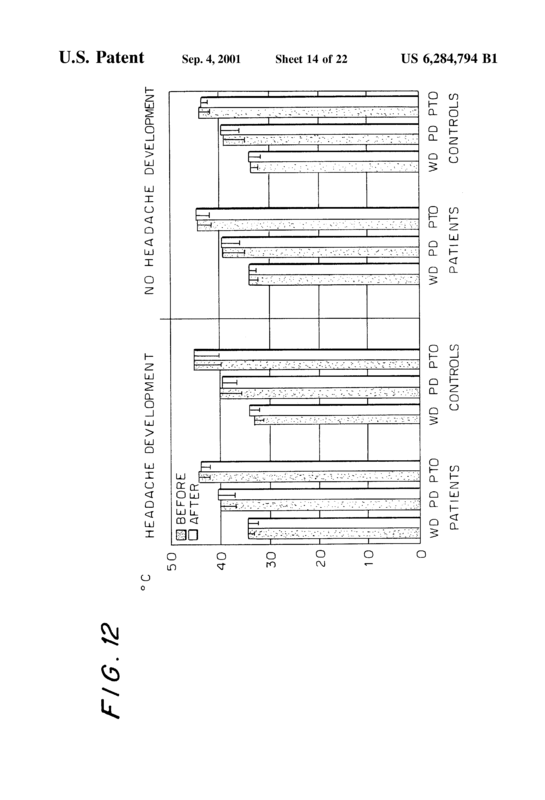 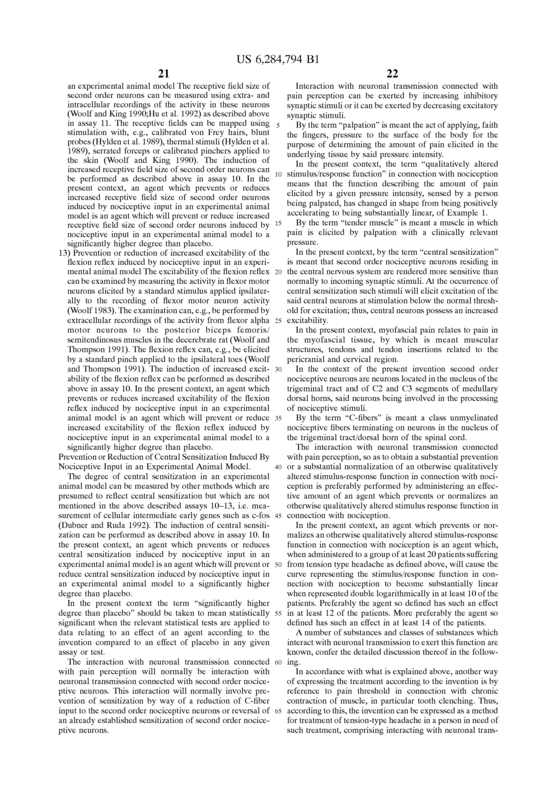 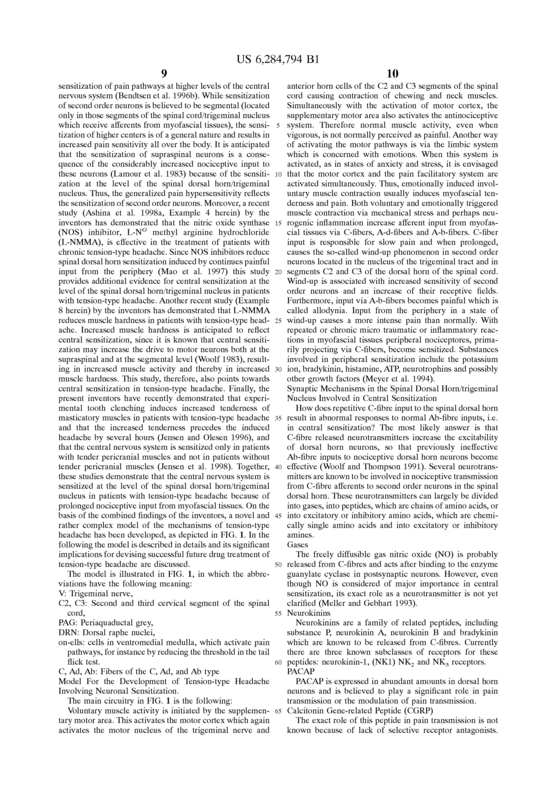 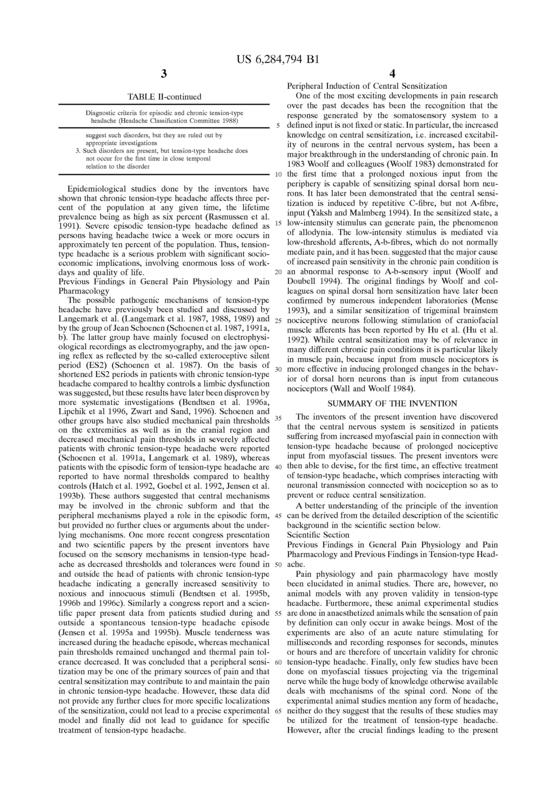 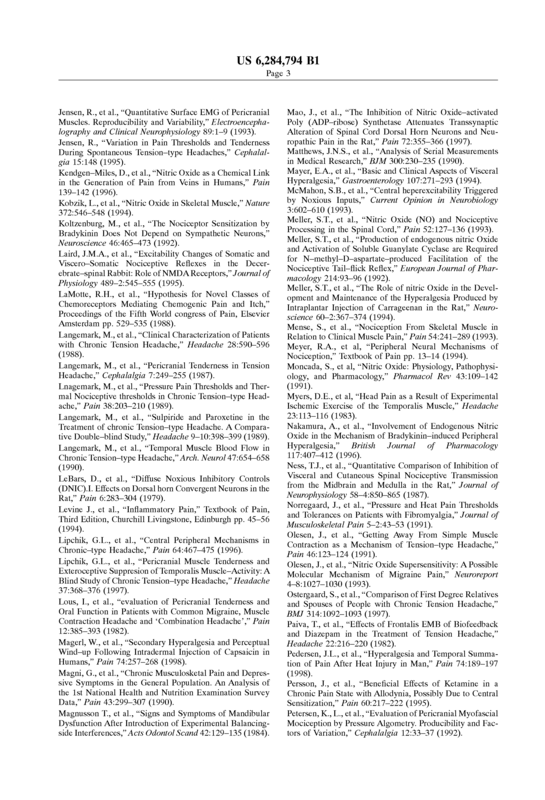 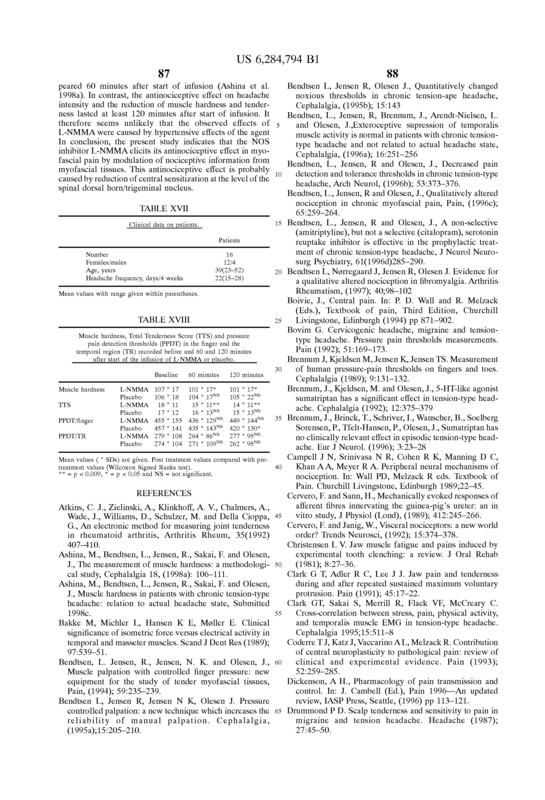 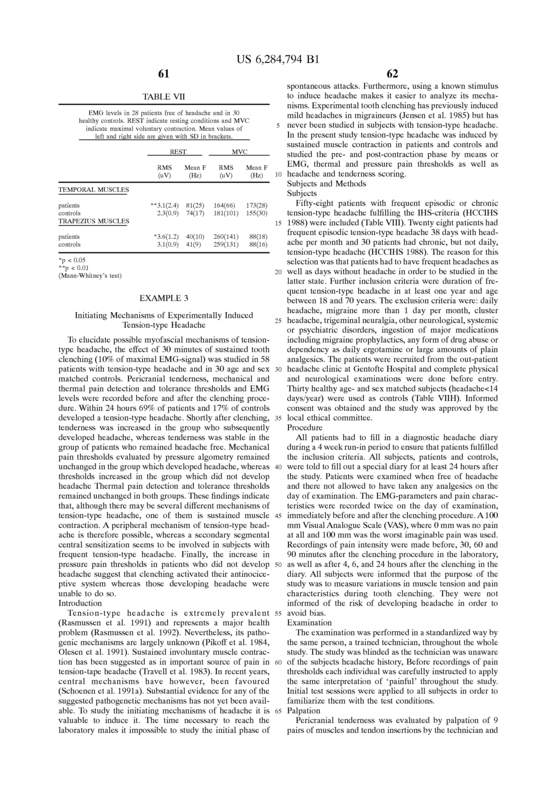 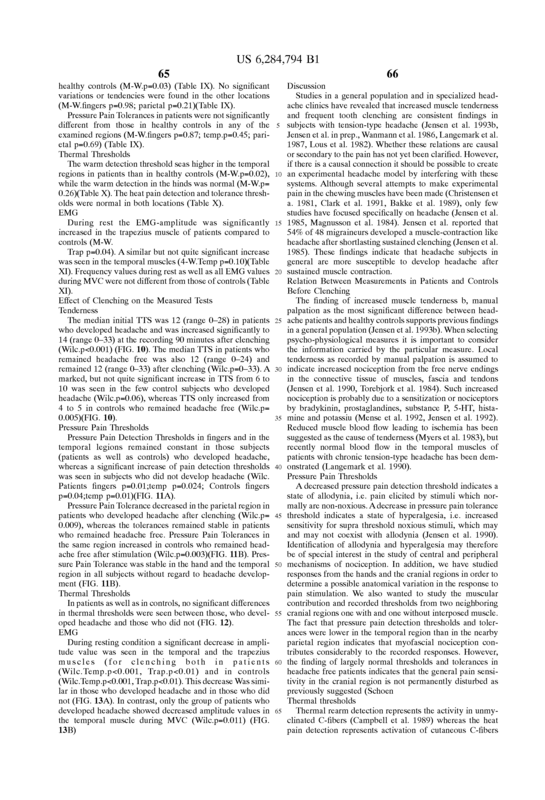 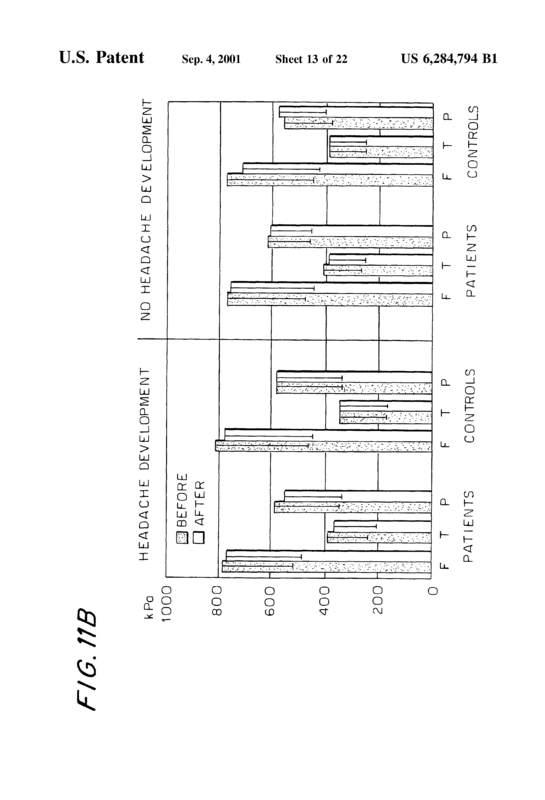 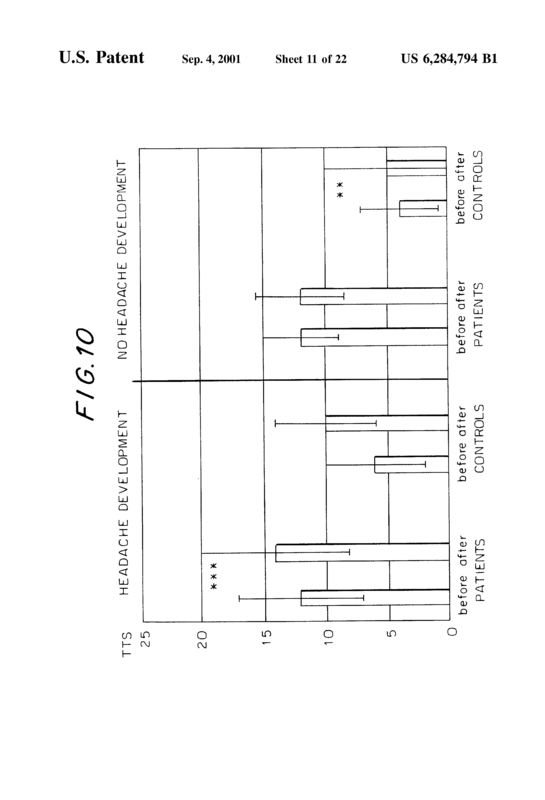 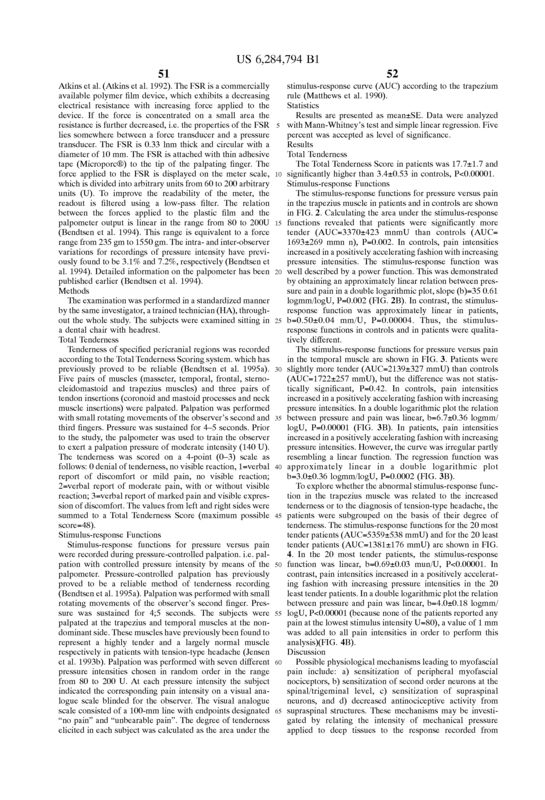 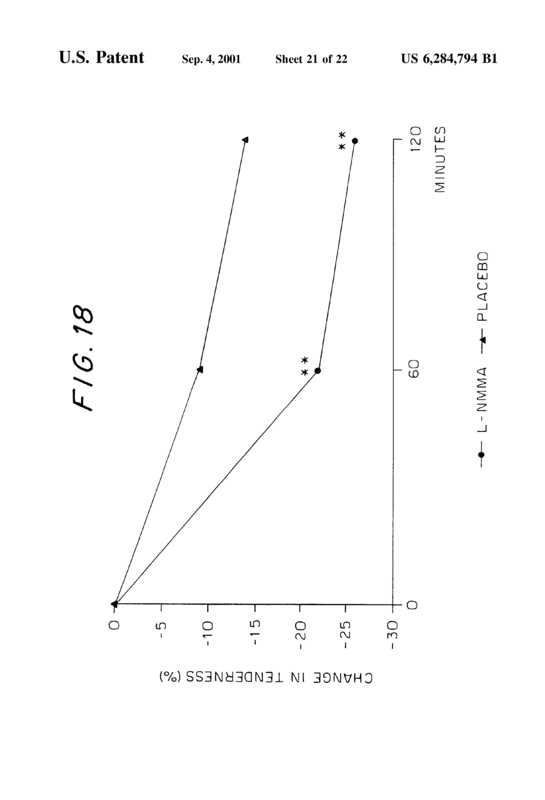 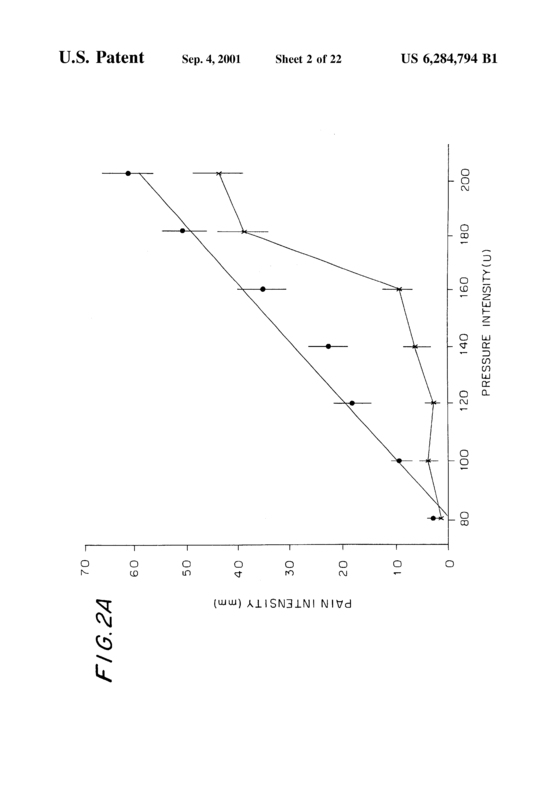 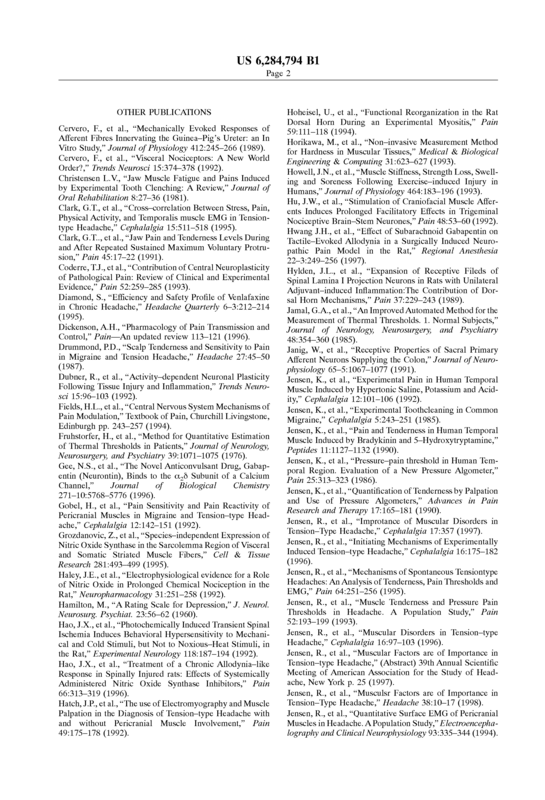 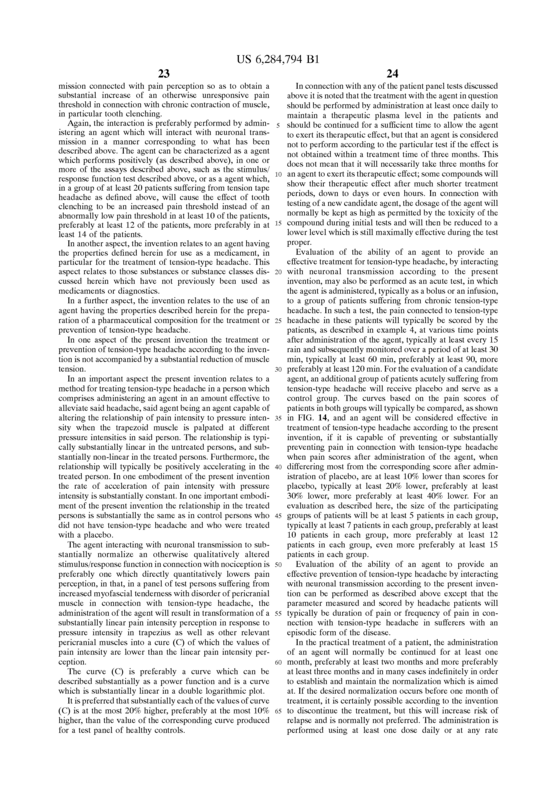 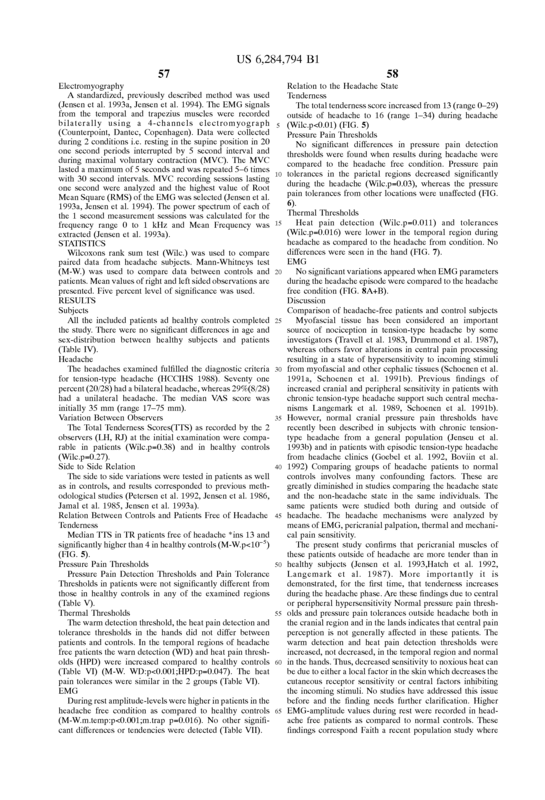 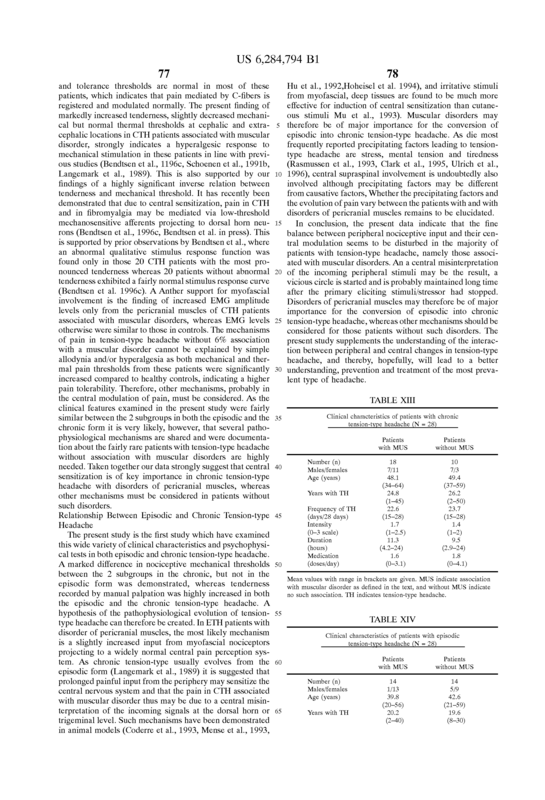 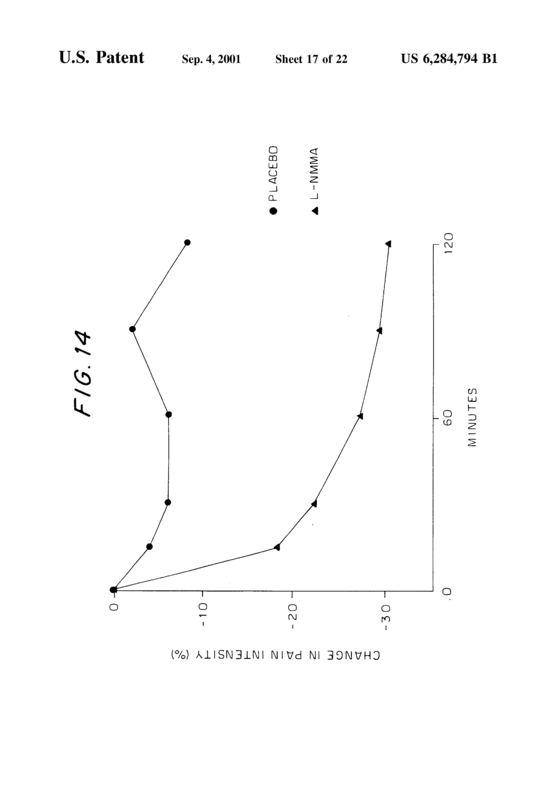 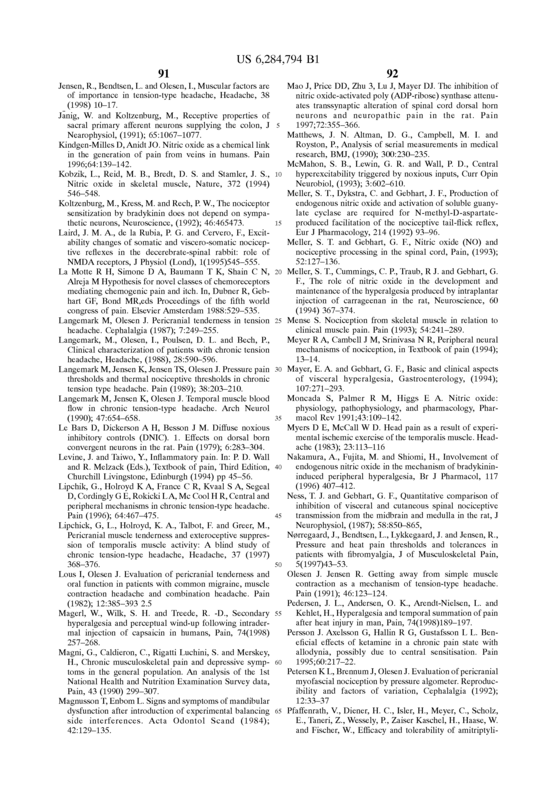 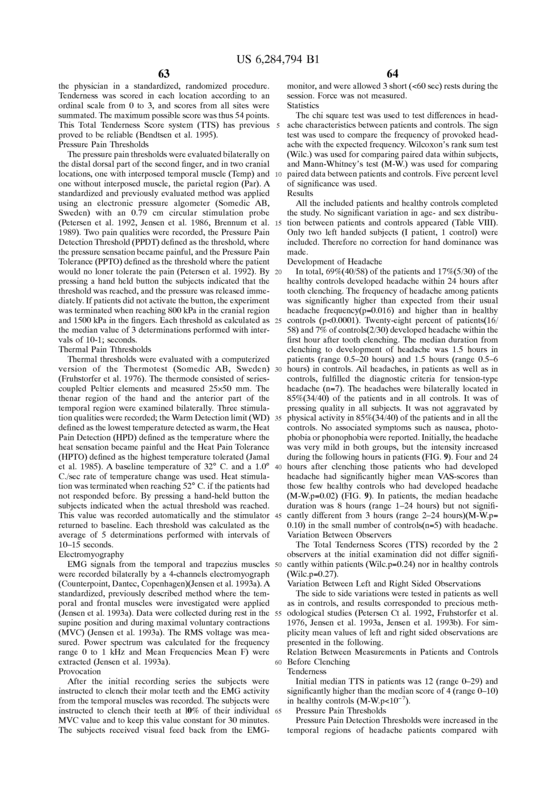 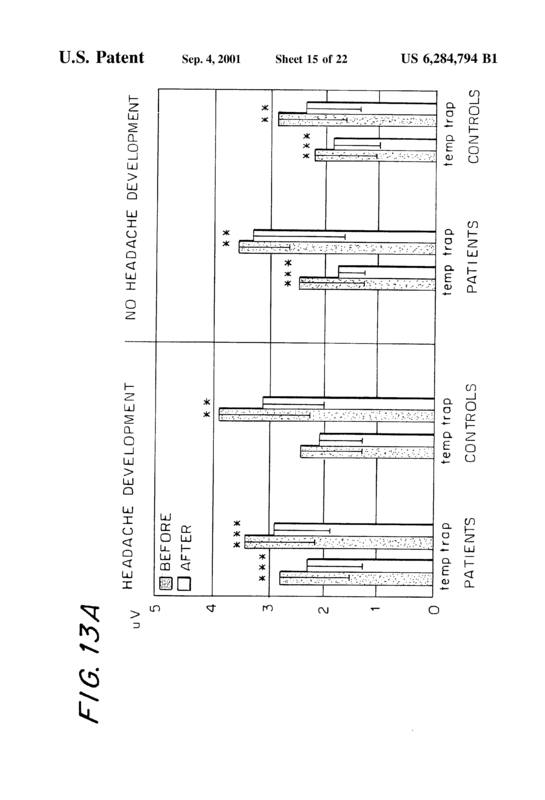 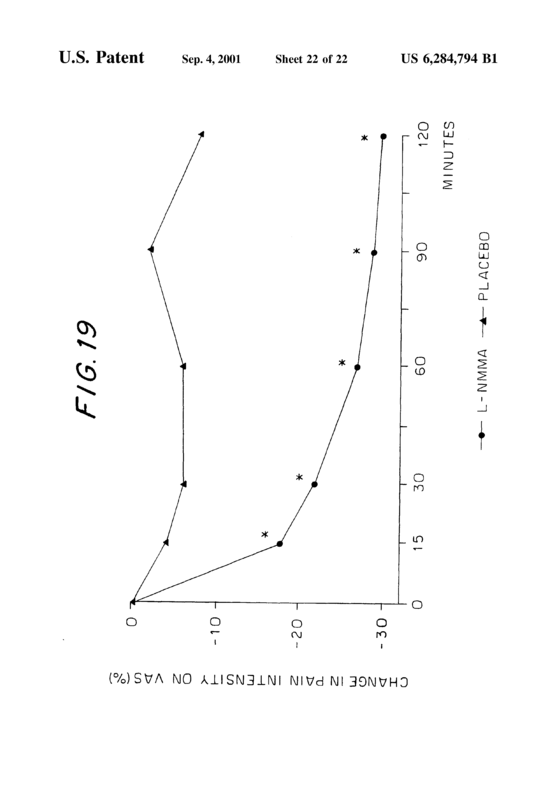 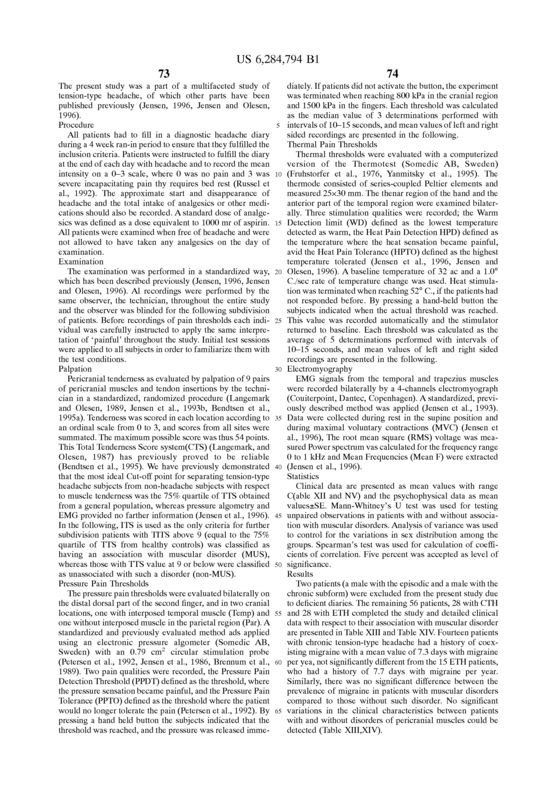 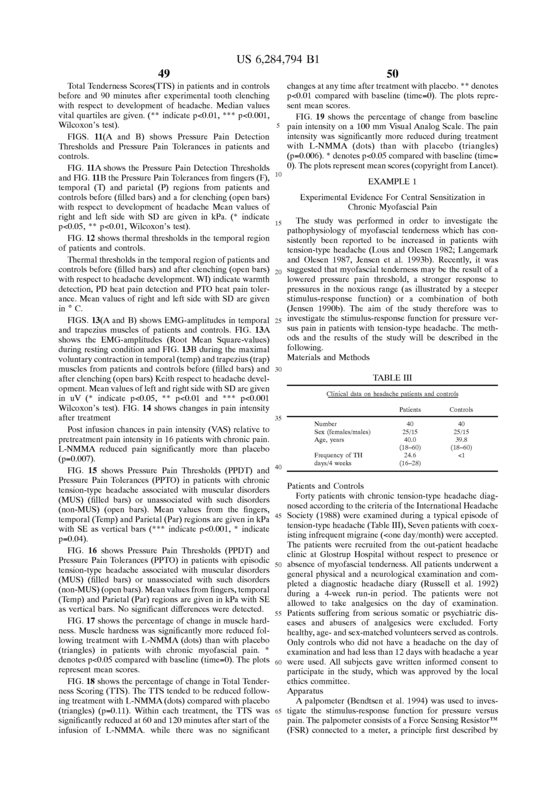 A method for treatment or prevention of tension-type headache in a person in need of such treatment, comprising administering to said person an amount of an agent which, in the peripheral and/or central nervous system, is effective to specifically interact with neuronal transmission connected with pain perception by substantially antagonizing the action of nitric oxide or nitric oxide synthase (NOS). 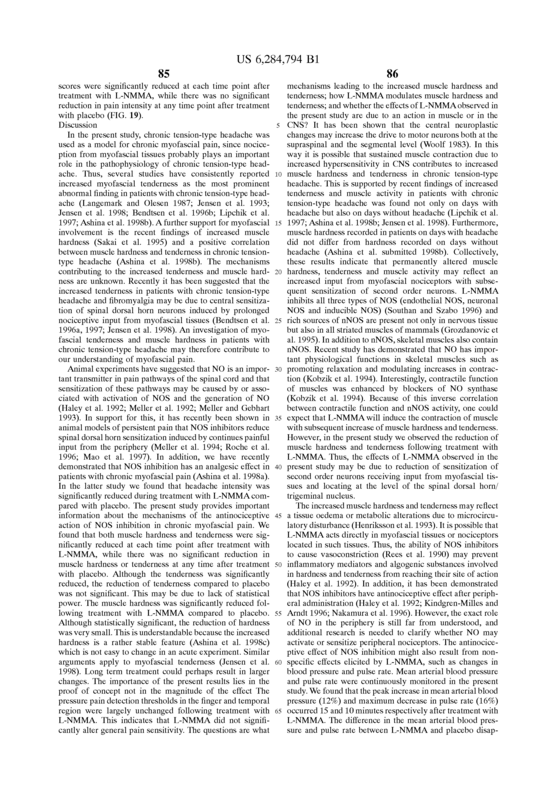 A method according to claim 8 , wherein the agent comprises a nitric oxide inhibitor. 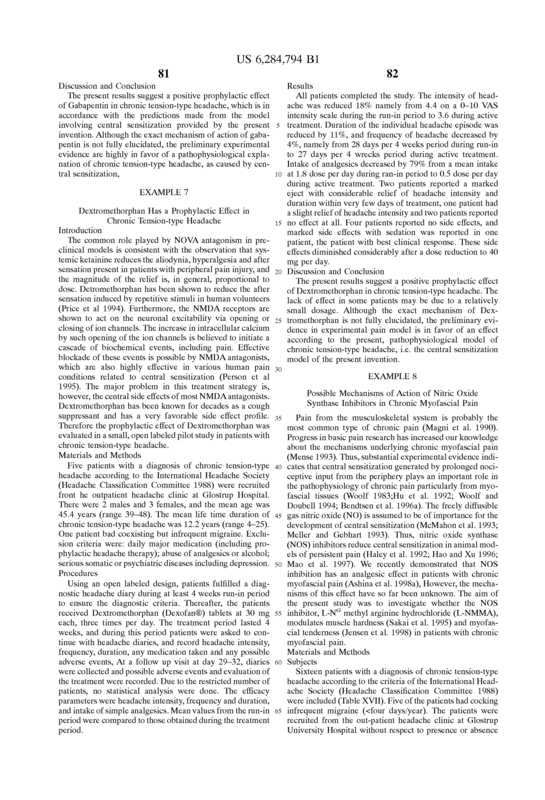 A method according to claim 8 , wherein the agent comprises an NOS inhibitor. 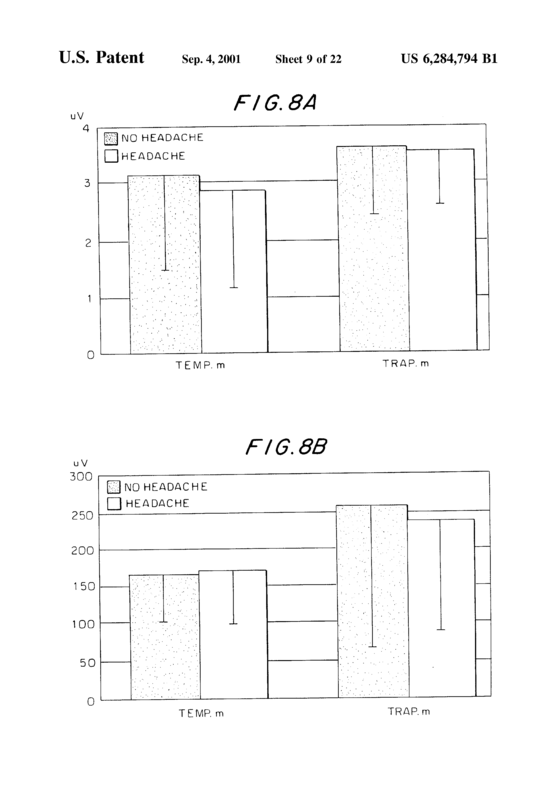 A method of treatment of tension-type headache comprising administering to a person in need of such treatment an effective amount of an agent which is capable of substantially inhibiting the action of the enzyme nitric oxide synthase (NOS) and thereby reduces chronic pain in connection with tension-type headache. 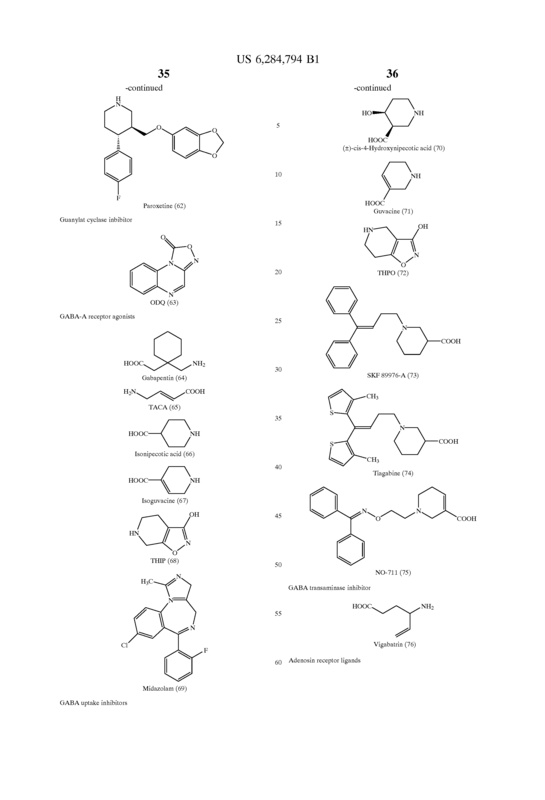 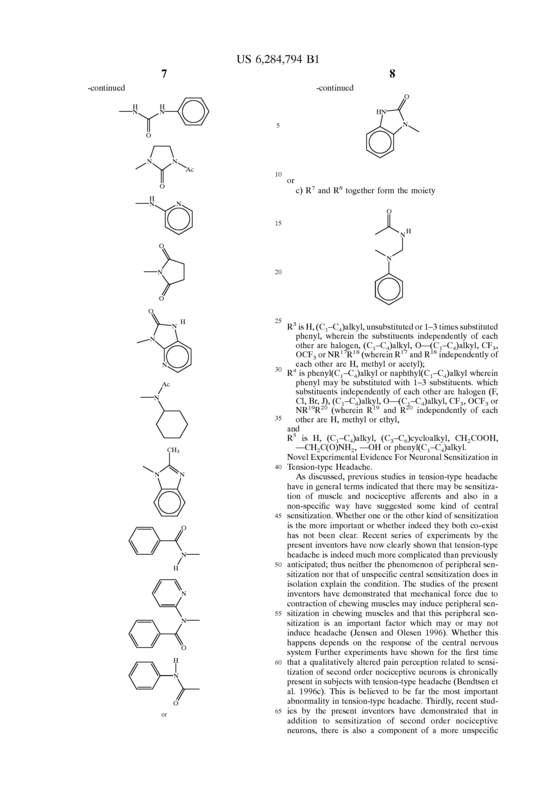 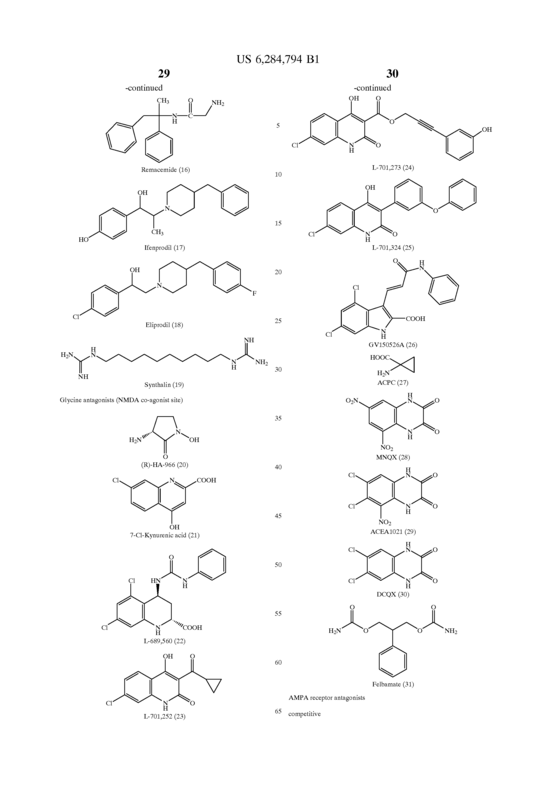 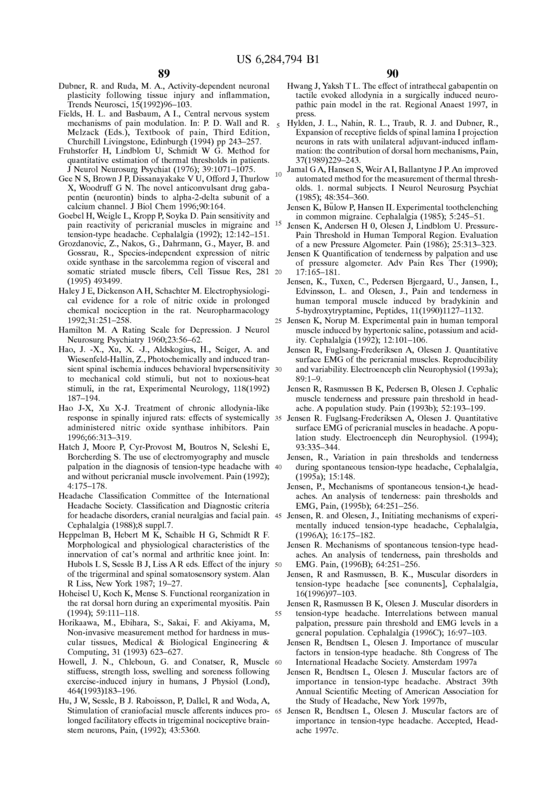 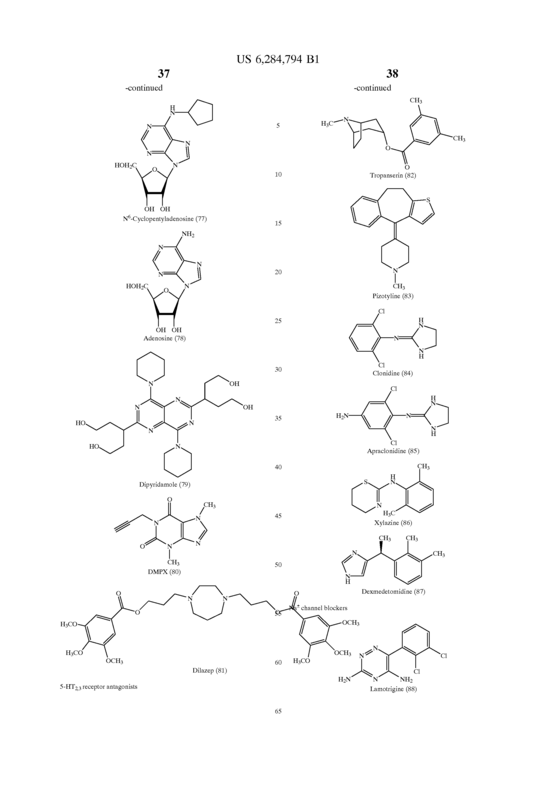 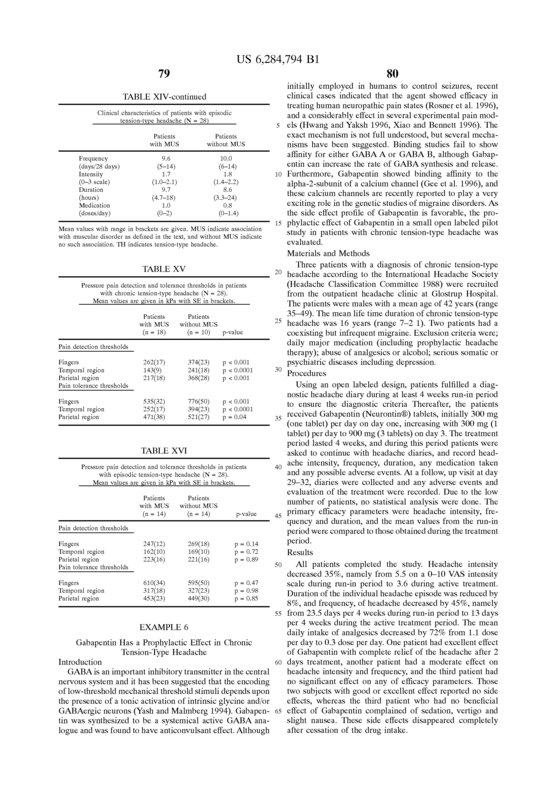 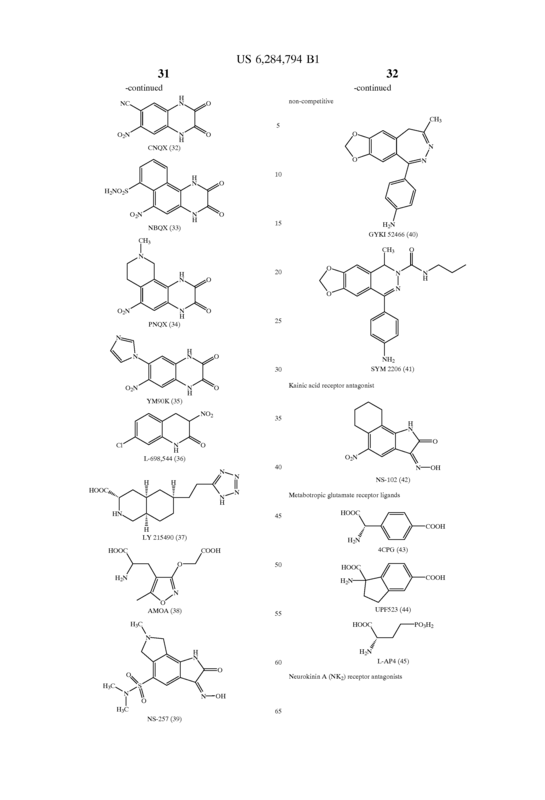 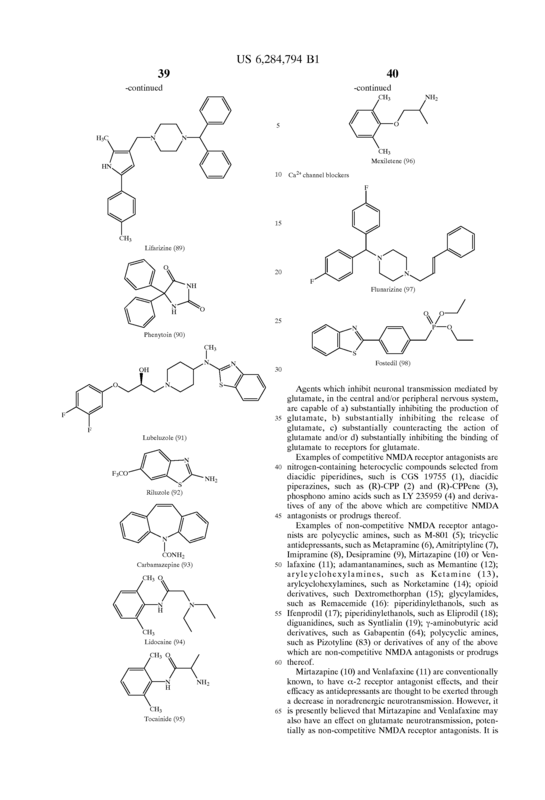 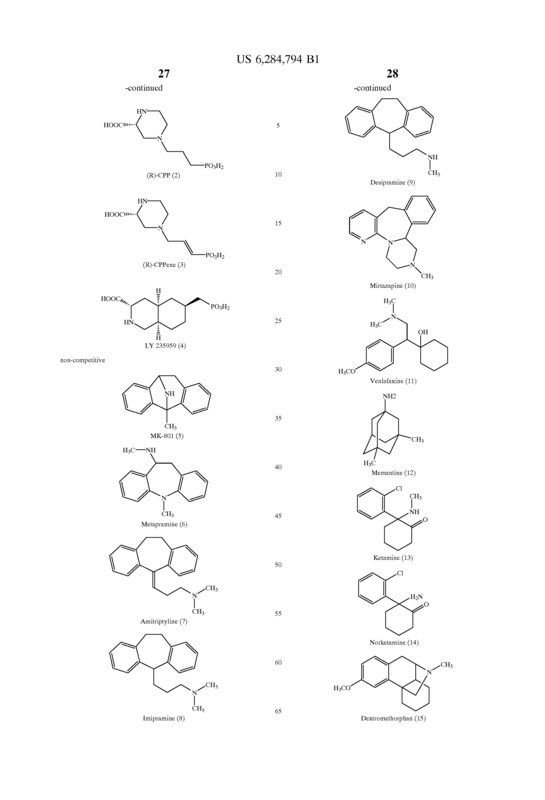 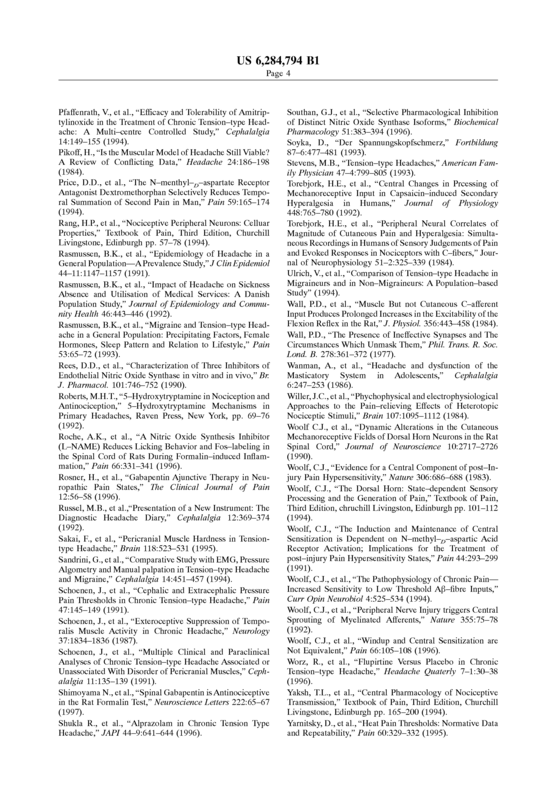 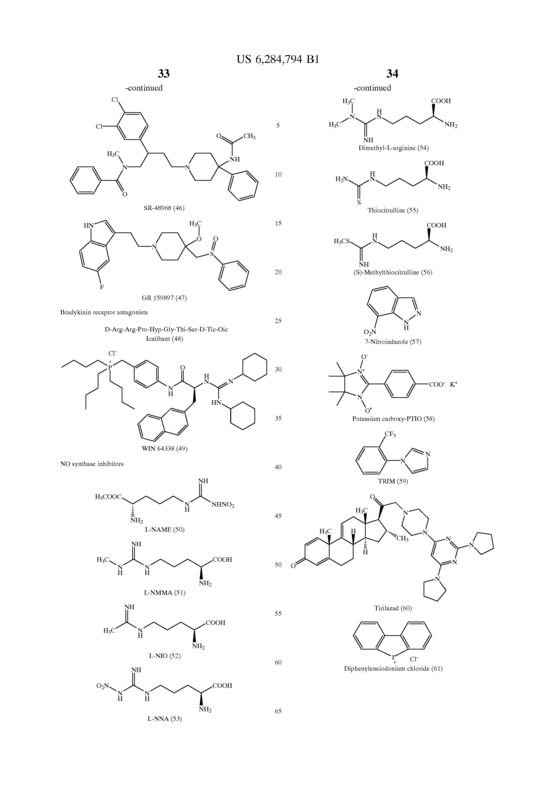 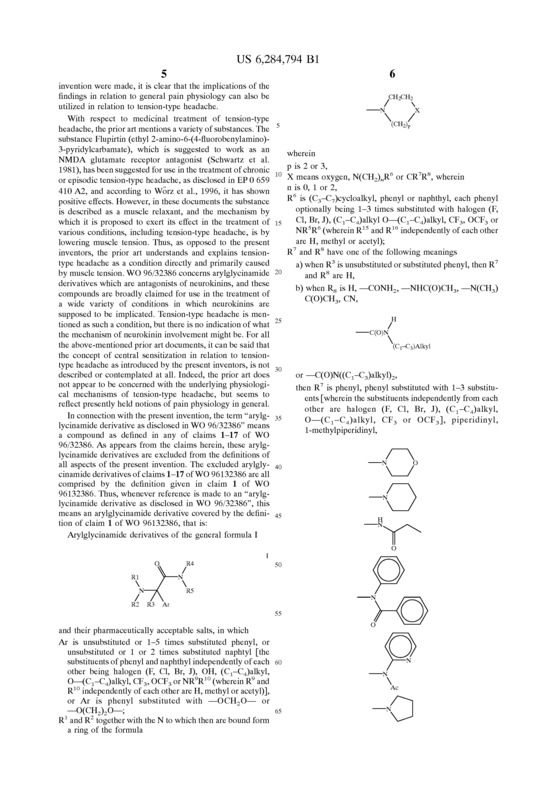 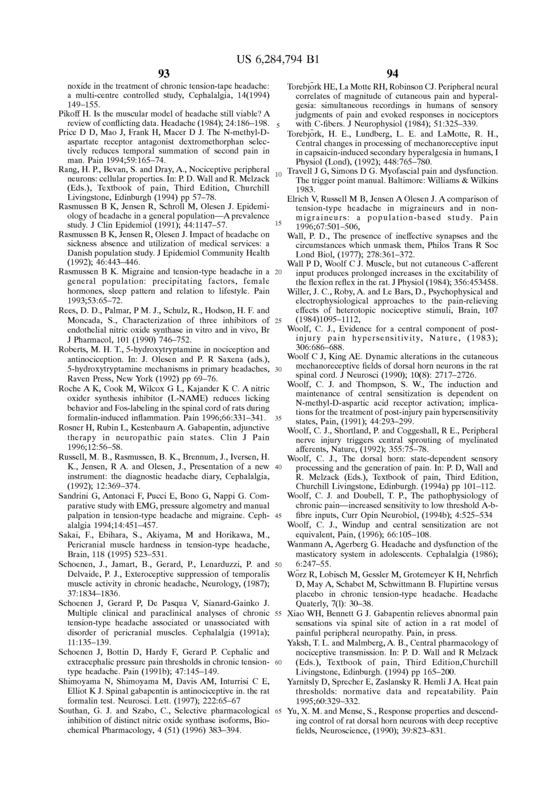 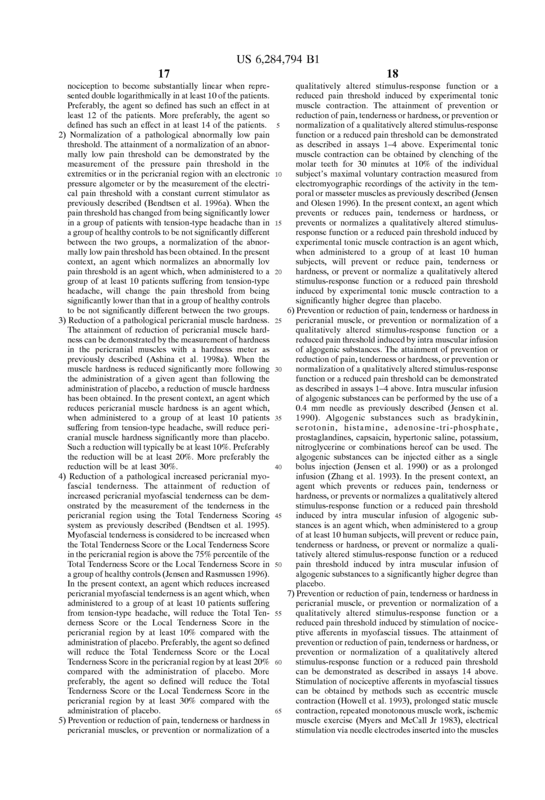 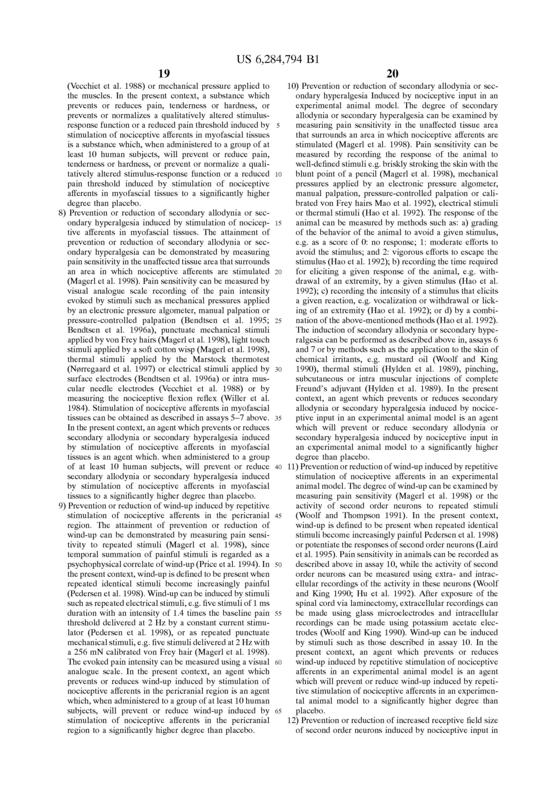 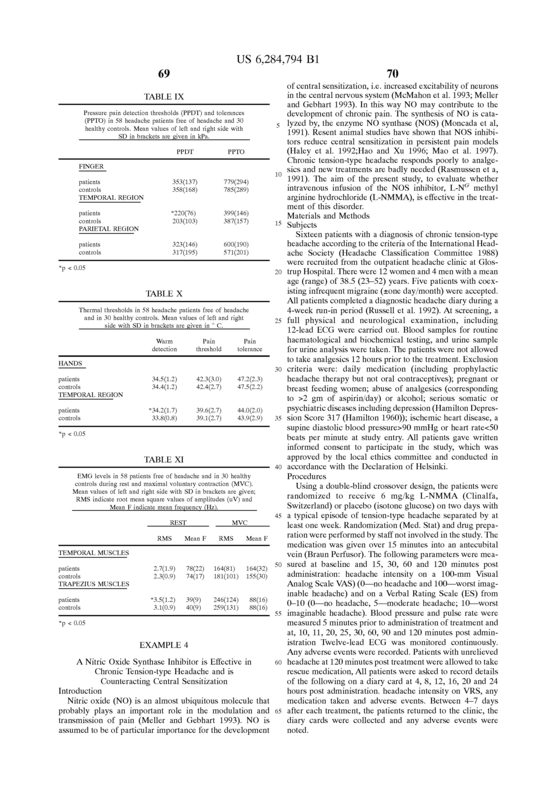 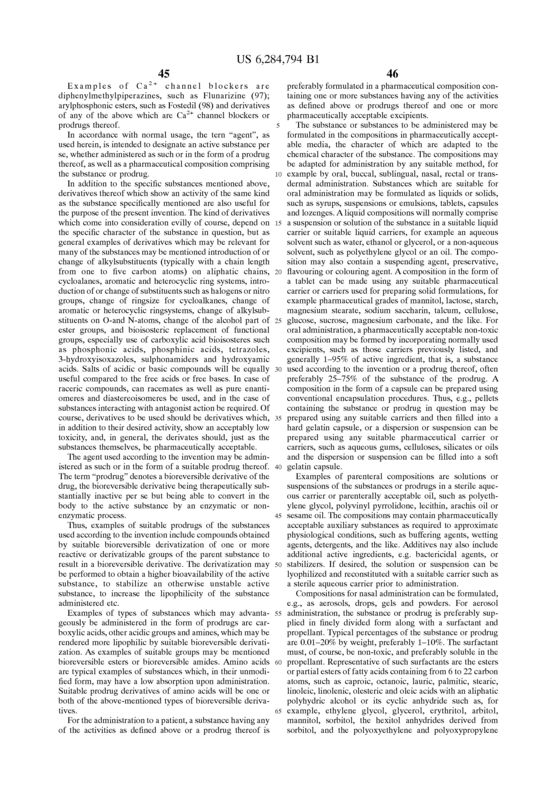 A method according to claim 11 , wherein the agent is selected from the group consisting of arginine derivatives, citrulline derivatives, indazoles, imidazolin-N-oxides, phenylimidazoles, biphenyls, piperidine derivatives or derivatives of any of the above which are NOS inhibitors or prodrugs thereof.